Viscosupplementation is an injection of a fluid called hyaluronic acid into a joint, most commonly the knee or shoulder. This injection is used to treat the symptoms of osteoarthritis (OA). Healthy joints contain synovial fluid. This fluid lubricates and provides nutrients to the joints. With OA, the synovial fluid becomes thinner and less useful as a lubricant for the joint. 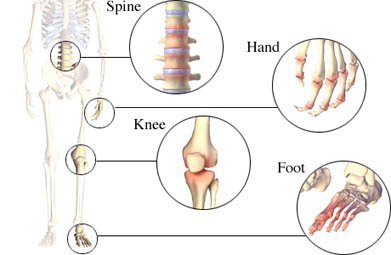 Hyaluronic acid, which is found in synovial fluid, is injected into the joint. This makes the synovial fluid act as a better lubricant. It is hoped that this will reduce pain and improve function of the joint. In some cases, getting this injection may help to postpone surgery on the joint. Viscosupplementation may be a good option if you have tried other types of treatment and these have failed. If you are taking any prescription medications, over-the-counter products, or herbs and supplements, talk to your doctor. There could be an interaction with the injection. First, your doctor will clean the skin where the needle will be inserted. A local anesthetic may be applied to numb the area. If you have swelling in the affected joint, the doctor will use a needle to remove the excess fluid. Next, a needle will be used to inject the hyaluronic acid into the joint. If needed, both joints can be done at the same appointment. While your schedule for receiving injections will vary depending on the brand. You may have just 1 injection or a series of 3 injections spread out over a period of days. You may need to go through injections more than once. In some cases, it can relieve pain for months to years. The procedure usually takes a few minutes to do. You may feel the prick of the needle. Right after the injection, you may have some mild pain, warmth, and swelling around the affected joint. Apply ice to the affected joint to reduce swellng and pain. Avoid straining the affected joint for the first couple of days. Do not stand for a long time or do strenuous activity, like heavy lifting. Arnold W, Fullerton D, Holder S, May CS. Viscosupplementation: managed care issues for osteoarthritis of the knee. J Managed Care Pharm. 2007;13(4 Suppl):S3-S19. Available at: http://www.amcp.org/data/jmcp/May07%5Fsuppl.pdf. Injection therapy for osteoarthritis (OA) of the knee. EBSCO DynaMed Plus website. Available at: http://www.dynamed.com/topics/dmp~AN~T916957/Injection-therapy-for-osteoarthritis-OA-of-the-knee . Updated December 15, 2017. Accessed December 20, 2017. Joint aspiration. Cleveland Clinic website. Available at: https://my.clevelandclinic.org/health/treatments/14512-joint-aspiration. Accessed December 20, 2017. Osteoarthritis (OA) of the glenohumeral joint. EBSCO DynaMed Plus website. Available at: http://www.dynamed.com/topics/dmp~AN~T115752/Osteoarthritis-OA-of-the-glenohumeral-joint . Updated December 6, 2017. Accessed December 20, 2017. Viscosupplementation treatment for arthritis. Ortho Info—American Academy of Orthopaedic Surgeons website. Available at: https://orthoinfo.aaos.org/en/treatment/viscosupplementation-treatment-for-knee-arthritis. Updated June 2015. Accessed December 20, 2017.